I’ve decided that cheese making is going to be my new winter hobby. Like most people I assumed that cheese making required a lot of exotic equipment and supplies that were out of the scope of the home kitchen. Turns out I was right on the first two counts but not on the third. Looks like it’s time to build more food gear. Depending on what kind of cheese you make it can be as simple as a pot, a spoon, a thermometer, lemon juice and milk to make ricotta or it can get complex with mesophilic cultures, cheese molds and a press, inoculation of beneficial bacteria and storage in a temperature and humidity controlled cheese cave to make Roquefort. I recently tried making ricotta, one of the easiest cheeses to make, and was thrilled by the results. Next came mozzerella. The first try was not quite there but the second try was more than acceptable. I was hooked. Wanting to move on to some more complex cheeses, I sent away for the classic home cheese making text aptly named Home Cheese Making. Around the same time my wife, Molly, found a blog called the Greening of Gavin who had just posted about his cheese making efforts. 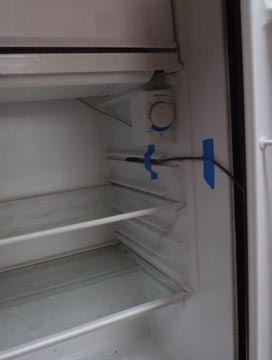 He mentioned his “cheese cave” in the post which was just a refrigerator with an external temperature controller. This was it, my bridge from dilettante cheese dabbler to home cheese enthusiast! Even though we live in a relatively small and already packed house, I knew I had to have a cheese cave of my own to store all of the tasty cheeses I’m going to make. Starting from Gavin’s blog I did some research on temperature controllers and where to get them. I toyed with the idea of making my own with an arduino microcontroller but it seemed like that was more project than I was looking for. 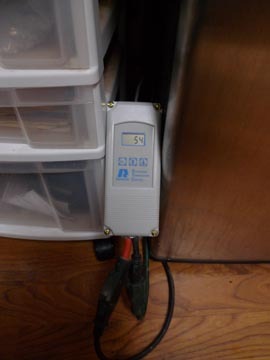 I learned that homebrewers use temperature controllers to set the temperature for holding lager beer at the right temperature. I found a very reasonably priced ($50 ish) controller from Patriot Supply. We already had a small fridge that wasn’t getting used in our outdoor kitchen. That got moved inside and set up under our work table in the living room. 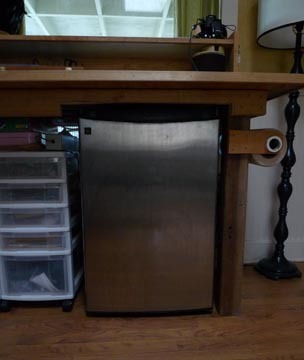 It almost fit under the table but was about an inch too tall so I had to cut out a notch in the brace under the tabletop in order to slip the fridge in. 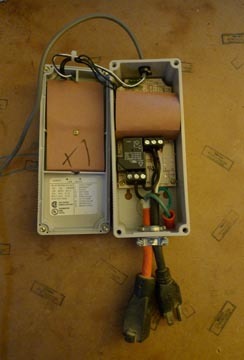 You need to wire a male and female plug into the controller which was very straightforward. The documentation is clear and the whole process took about 20 minutes. 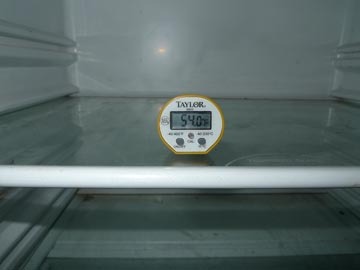 A temperature probe called a thermistor goes into the fridge. This tells the controller what’s going on. and it appears to be working perfectly. I should be able to cure sausages as well in here. Yum… The cave is the first step in gearing up for home cheese production. Next is the cheese press. My plan is to reuse most of the components from the sausage stuffer to make a press. Then there are the cultures and molds and wraps and wax to acquire… I still have a bunch of reading to do before I’m going to be ready to make some more difficult cheeses but the cave is a big step in the right direction. My cheese making has been pretty limited but I have a friend who has been doing this for a couple years with great success. Humidity can be tricky in such a small space. I just put a small Tupperware container filled with water in the bottom of the fridge. You need to keep an eye on things because it can easily get too humid in there. Putting a healthy amount of salt in the water will help with preventing mold from forming. I don’t have a small refrigerator, but I do have an unused (currently) kegerator . If I installed the shelves in it, do you think that would work? As long as you can set the temperature accurately the kegerator should work beautifully.